Like many other Vancouverites a few Sundays ago, I set out into the sunshine with hopes of achieving a personal best, but my dreams of glory had nothing to do with sweating it out with 50,000 others, adorned in spandex, participating in the Vancouver Sun Run hour and everything to do with throwing on comfortable clothes, ambling down to Legacy Liquor Store and stocking up on craft beer. Normally when I enter liquor stores like Legacy, Firefly, etc, I literally spin in circles, losing all sense of time, while trying to decide what beers to place in my basket. I must look like an adult afflicted with ADHD, who has stopped taking my Ritalin, as I flit from one side of the craft beer section to the other, distracted by the brilliant selection of craft beers and all their shiny labels, but on this particular Sunday I was in and out of the shop with a personal-best, sub-15- minute time. I do have to admit my awesome display of efficiency that particular Sunday had more to do with my nine-month-old daughter deciding to test out the acoustics of the cavernous space that Legacy occupies than my own personal focus and commitment to time management, but it was a feat to brag about all-the-same. My wife didn't share my enthusiasm though, especially after finding the receipt for the beers which were threatening to collapse my daughter's stroller. ﻿ While scanning the Legacy beer shelves to see what was new and exciting, store GM, Darryl Lamb, wandered over and handed me a six-pack labelled "Discovery Pack Spring 2011", which consisted of beers from six different Ontario craft breweries, packaged and put together by the Ontario Craft Brewers (OCB). Darryl explained that he had stumbled across the product and contacted the OCB to have some of the Discovery Packs shipped out for his store. This current version of the Discovery Pack is the 8th version, first having been released in 2007 and are curerntly being released at the beginning of every new season. I thought this was a very clever method of marketing and a sign of the commitment of the craft brewers in Ontario, who compete in the same market for the same dollars, to work together to collectively further their cause in general. These seemed like artisans and business people who got the Big Picture. ﻿﻿ Having grown up on the Westcoast, having spent much of my life avoiding Ontario and having the inter-provincial roadblocks in place that make it difficult to export beers from province to province, I know little about the craft beer scene there. I did notice that the six-pack included something from Black Oak Brewery which made me take notice as last summer I had the chance to sample a a very tasty IPA from Black Oak, which had been illegally snuck into our great province by someone who dared cross our provincial borders with alcohol without going through the BC LDB (a rant for another time), so I thought I'd give the Discovery Pack a go based on my enjoyment of that bootlegged brew. Once I got home I felt celebration was in order, seeing as I had just posted a personal best time, so I cracked open the six pack and began to see what Ontario had to offer. Although the six-pack is described on the OCB website as "a hand selected combination of great brews," I found the beers to be solidly crafted but not "great. This might be due to the fact that I have grown accustomed to the huge beers being produced out here on the West Coast which has resulted in me developing a taste for hops to the extreme. 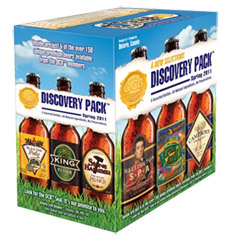 I would describe the Discovery Pack beers as "starter" craft beers for those just making the leap from the world of marcobrews to craft beer and not for those looking to have their taste buds assaulted by big hops and high alcohol. Despite the relatively tame nature of the beers (in my opinion), my curiosity was peaked by the concept of competing breweries cooperating to package together and promote their products to further the cause of Ontario craft breweries. I have seen many "mixed packs" here in BC, but to my recollection they were always from one particular brewery and marketed by that brewery. I have never seen a collaboration between breweries here in BC in regards to packaging their products together for the betterment of the BC craft beer industry as a whole. I wanted to find out more about the OCB and immediately wondered why we haven't seen similar collaborative marketing here in our province. Inside the six-pack box I found a few other interesting items, namely two pieces of literature, produced by the OCB, directed at promoting Ontario craft beers. 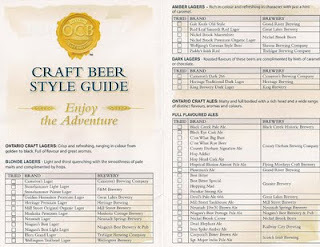 The first insert I read turned out to be the OCB's "Craft Beer Style Guide" which listed all the OCB member breweries along with a list of all their 150+ beers, arranged by style and with brief tasting notes typical of that style. It was in a checklist form so that you could mark off which beers you have tried, much like the old checklists you would get in your hockey card packs back when hockey cards smelled of cheap gum and often ended up in the spokes of your bicycle and not in albums and plastic protectors. The other item inside was an advertisement for the Ontario Craft Beer Week, which takes place in June and is organized by the OCB to help promote their products and beer tourism in Ontario. This, I found interesting as well as almost all the beer festivals that take place here in the Lower Mainland, especially since the demise of DIX, may she Rest in Peace, are not organized by the brewers, but by groups like CAMRA and the Vancouver Craft Beer Week who advertise and promote the events. "We're the Ontario Craft Brewers, 25 brewers dedicated to making great tasting beer, right here in Ontario. The reason we got together is to promote our fresh, natural, quality beer and agree on a commitment to excellence that everyone has to live up to. We chose "Ontario Craft Brewers" as our name, because it speaks to the tradition of care and craftsmanship that we insist upon when brewing our beer. It's taste that we're obsessed with, and taste that distinguishes us from other beers, so naturally our slogan is "Taste. The difference." The OCB have even taken their collective commitment further, developing an OCB Brewer's Philosophy, signed by participating brewers and brewery owners, which sets out clearly the Ontario's brewers' dedication to art of brewing craft beer and supplying the consumers with craft beer of the highest quality, while supporting each other as Brothers in Arms, to further the cause of craft beer in Ontario. The OCB makes it clear on their website that they want to be apart of their communities and contribute positively towards the quality of life in those communities. They have successfully managed to lobby the Ontario goverment who have developed a $5 million, five year, Ontario MicroBrewery Strategy, that provides funding to the OCB "for marketing, training and other promotion activities" for the province's craft breweries. The Onatario government has also developed the $8 million, Ontario Craft Brewers Opportunity Fund (OCBOF) to help support and develop small to medium craft breweries in the province to compliment their Ontario Microbrewery Straregy.. The OCB have utilized this funding, along with the fees/dues they charge their members, to develop many advanced and diverse methods of promoting their beers. They have had a free iPhone app developed, that helps consumers track down craft beer in Ontario and have podcasts, entitled "Ontario Brewer". They also organize brewery tours for member breweries, run radio spots, produce videos relating to craft beer, organize the Ontario Craft Beer Week...the list goes on and on. Their website is full of educational information about Ontario craft breweries, craft beer, beer styles, cask beer, interactive tasting guides, maps to liquor stores/retail outlets, local pubs and restaurants that offer craft beer, a "Discovering Our Beer Guide" and recipes using Ontario craft beer. They even have an on-line (printable) press kit full of background information, facts and statistics relating the the Ontario craft beer industry. I highly recommend it to any beer geek heading out to Ontario and, for that matter, anyone who is interested in craft beer in general, as there are many educational tools and links to beer resources and interactive tools on the site. I literally could have spent hours on there poking around, following the links and reading about Ontario craft beer and craft beer in general. 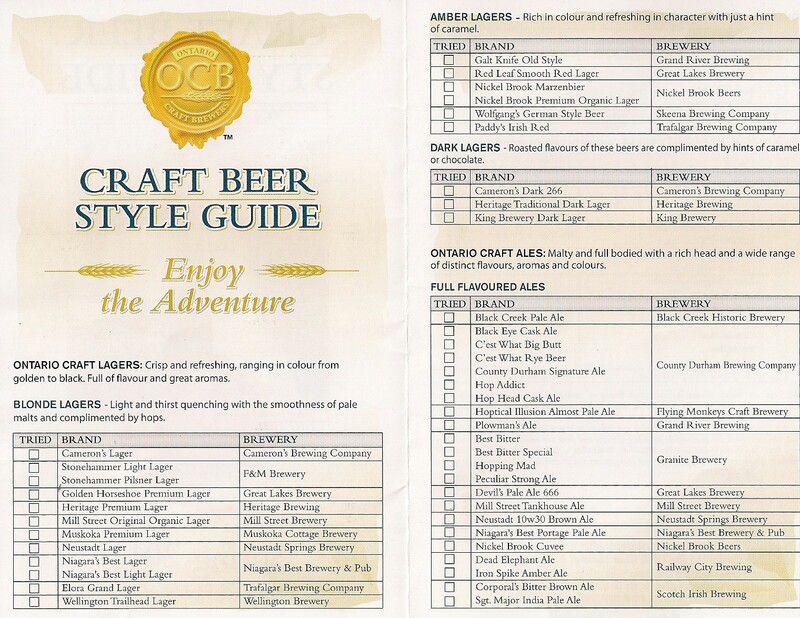 If the information and the energy put forward by the OCB, via their website and their Discovery Pack packaging is any indication, it appears the craft beer scene in Ontario is alive, vibrant and very well supported by the brewers/brewery owners themselves who are spearheading their pubic persona, as one, through the OCB and who have sucessfully garnered the support of their provincial governement. They have taken the proverbial bull by the horns and, as stated in the OCB press kit, "banded together under the Ontario Craft Brewers banner to provide collective marketing muscle, promote regional tourism and expose Ontario's beer drinkers to a world of more than 150 handcrafted premium beers brewed in their own home province." What a concept! Banding together to create one collective voice (sound familiar CAMRA YVR members??). Competing forces pulling together for the betterment of all involved. Now let's compare that to the BC craft beer scene and how the BC Craft Brewers Guild (BCCBG), formerly known as the Craft Brewers Association of BC, is helping promote the cause of the craft beer industry here in Beautiful BC. It is true that here in BC we have an alive and vibrant craft beer scene as well. BC brewers are not only producing good craft beers, but world class craft beers that are pushing boundaries and causing the rest of North America to take notice. And it is not just one brewer, but several that are creating these amazing beers. There are several brewers at the moment that are challenging each other to keep up and push the envelope with their brews. I dare say that soon, if it isn't already happening, local brewers will be creating new craft beer trends and styles that others, from across Canada and N America and around the world, will be trying emulate in order to keep on the cutting edge of craft brewing. And those of us who drink these beers are enjoying the fruits of these creative labours. But While the craft beer scene has bneen exploding here in BC, it seems this explosion has taken place with little-to-no help from the Craft Brewers Guild who, at least at first glance, seem invisible to the general public. I am not a brewer, but have been involved in the craft beer industry in Vancouver for over 10 years, yet I know little about the BCCBG and what they do. "Welcome to the home of some of the world's best beers. While in BC, enjoy your stay here and feel free to sample the artisinal offerings of our members. In 1997, a group of BC Craft Brewers got together for the purpose of establishing a non-profit, cooperative trade organization committed to the promotion of the Craft Brewing Industry through legislation, education, public awareness, and the responsible use of our products." I decided to make a few phone calls to try and find out what is happening with the BCCBG and to see if all the rumours I have heard swirling about have any substance. Depending on who you talk to, you get a very different picture of what the BCCBG is about and how the BC brewers are working together - or not. Tod Melynk was more than willing to speak to me about the BCCBG and put a very positive spin on things with the guild. According to Melnyk, the group is currently reorganizing, refocusing and figuring out priorities and "getting everyone on the same page". When asked about the lack of public presence, including the website, Melnyk, who is co-chair of the group, along with Matt Phillips (Phillips Brewery) and Jim Dodds (Vancouver Island Brewery), stated members have been occupied running their respective breweries and unable to contribute significant time or financial resources to the BCCBG. He did state that they have been "working in the background and tackling issues when they arise" such as putting forth a position paper in regards to the proposed changes to the tied house/trade practice laws. I could not really get what the BCCBG's position was in regards to tied houses and trade practices other than Melynk telling me member breweries did get together, via conference calls, to voice their opinions and come to a consensus on a position. When queried about the BCCBG's membership and obvious names missing, Melnyk stated he has fielded "several calls recently" from representatives of breweries and brewpubs inquiring about joining the guild and said that there is significant interest amongst the craft brewers in BC to get organized and work together. As an example, Melnyk pointed to the recent collaboration by 28 craft brewers who got together at R&B Brewery to create a Cascadian Dark Ale that will be available during the Vancouver Craft Beer Week. Melnyk did point out that this collaborative brewing session was organized by the VCBW and not the BCCBG, but saw the getting together of all the brewers as a positive sign. I also queried Melnyk about the rumours about the in-fighting and conflicts that many feel are the main reason why the BCCBG appear to be stagnant and ineffective and Melynk stated that there has been conflict amongst members, "a few years ago," and that at times "small issues pertinent to one brewery have taken over the (BCCBG) agenda" but that those problems are a thing of the past. Melnyk stated that the BCCBG does have plans to put out collaborative products, such as the OCB's Discovery pack, update their website and begin an organized lobby to help "craft brewers get on a better playing field" in regards to competing in the market place and hopes to get the craft brewing industry the same government support the BC wine industry enjoys. Melynk also stated he has a personal vision of creating a special designation for craft beer similar to the wine industry's VQA designation for BC wines that meet certain criteria. 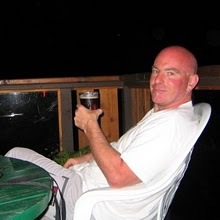 Rick Dellow, the R of R&B Brewing, who belong to the BCCBG, also stated in an email, that there are plans amongst the guild members to, "put together shared raw material buying and shared marketing," but that due to the guild members need to attend to their own businesses, these plans may not "see the light of day". Dellow also pointed to past BCCBG activities which have been successful, such as when the guild,"worked with a group of small brewers from all over Canada to lobby the government to reduce the level of Federal Excise tax," a lobby that was successful and resulted changes to the tax structure. Melynk stated that the main reason the BCCBG has not been able to organize and get to the level of their Ontario cousins is simply a result of money and time and has little to do with in-fighting and the BC brewers inability to work collectively. He pointed to the "substantial amount of money" the OCB got from the Ontario Provincial government and the fact that the OCB has a full-time "Executive Director" to help guide the group. These facts are true, the OCB has a President, John Hay and an administrative assistant and, according to PR contact, Christine Mulkins, who I contacted by email, "employs a variety of consultants on contract to provide support on finance, marketing, PR, branding, website, advertising/media, etc." Mulkins also stated that OCB members "play an active role in the association by participating on a variety of committees such as - technical, marketing, etc," and that they pay dues to be members to help fund the cause. My question is, if funding and resources are an issue, why can the BCCBG not follow Ontario's lead and go after the same funding from government and the guild members themselves? I know each provincial governement if diffeent and market places unique, but the BCCBG has a great blueprint to follow and could they not try to adapt the path the OCB has taken to suit their needs? I spoke to a few other brewers, some members of the BCCBG and some not, as well as others who are insiders in the craft beer industry and had a completely different picture of how the guild operates painted. A few brewers were not willing "to go on the record" but were more than willing to talk to me over a few beers to share their thoughts about the BCCBG and how it operates. I heard descriptors such as "disorganized", "dysfunctional", "useless", "not focused" and "splintered" used to describe the BCCBG. One brewer, Crannog Ales' Brian MacIsaac, who used to belong to the BCCBG but who opted out about four years ago, was more than willing to go on the record and state why he is no longer a member. I personally know MacIsaac and consider him to be a straight shooter, one who does not mince words and one whose business practices are honest and above board. Crannog has been very vocal about the lack of ethics in the craft beer industry and the lack of a "code of conduct" in regards to how craft breweries in this province conduct business. He believes it is paramount that the craft breweries hold themselves up to a higher standard than the macrobreweries do, not only with the beers they produce but with how they conduct themselves. He believes that although they compete in the same marketplace, for the same consumers' craft beer dollars, the craft breweries should be able to work together to advance the industry in BC while letting their beers speak for themselves. The beer industry is rife with what are illegal practices, such as kickbacks of free beer to pubs/restaurants, to breweries paying cash for the right to sell their beer in a certain establishment or breweries paying for beer lines to be installed for the privilege of selling their beer, but Crannog has refused to be apart of this, even if it meant losing potential business. Crannog's famous t-shirt depicting a hand flipping the bird with, "here is your 1-in-10," referring to the practice of giving one free keg for every 10 bought, sums up his thoughts on the issue. MacIsaac says the main reason he is not apart of the BCCBG any more is the "predatory" business practices of some of the member breweries and his distrust of them having access to "sensitive" information about his business. He states some guild members are "not cooperating" with the other members and that the guild is "not functioning as a group of colleagues". He went on to say certain breweries were not interested in making a stand against the kickbacks and the purchasers' demands for free beer or cash and were currently offering the kickbacks and inducements in the same manner as the bigger breweries with the deeper pockets. He states when he tried to get the members to formulate and implement a "code of ethics" or "code of conduct" he was not supported by the some of the guild members who are known to be quite aggressive in the marketplace and willing to go after the tap space held by other guild members in order to increase their own business. He also gave, as an example of the group's unwillingness to support each other, that when one member brewery came to the guild for support due to the fact an establishment demanded a payment of $1000 a tap, per year, to do business, that member brewery received no backing or support. In fact they were told by one of the guild members "it was the price of doing business," even though that "price" is currently illegal and something many small craft breweries, with limited resources, having been fighting against. MacIsaac told me he believes that some of the members of the guild are their for their own betterment and are not interested in helping develop the craft beer industry as a whole or work collaboratively in the guild. It comes down to greed and dollars and not the art of making craft beer and developing an ethical and sustainable industry. "When is it enough?" asked MacIsaac. "It (craft beer industry) should not just be about getting bigger and bigger." So which version of the BCCBG is the accurate one? I have had suspicions for years that some of the BC craft breweries who want to grow and play with the big boys in the market place have been predatory and ruthless in taking business away from their craft beer brethren in the name of growth. In fact, I won't buy beers from certain local breweries based on my knowledge of their business practices and have voiced my opinions to most who will listen. This type of behaviour is certainly going to splinter and fracture the craft brewers. The craft brewers are the first to complain about the Molson's of the world flashing their money about, buying taps and giving kickbacks yet some of them are just as bad and some of those protesting loudest are the worst offenders. Although there are many of the BC craft brewing heavyweights on the member's list, there are many that are not. I don't buy the excuse that there is a lack of resources available to the BCCBG which prohibits them from doing something as simple as put content on their website or update the name on it to reflect their name change. It appears to me there is just not the will amongst the BC craft brewers to band together to work towards common goals. I am quite sure the member breweries could buck up a few thousand dollars a year to hire professionals to help run their guild, such has been done in Ontario. First on the agenda should be to update and professionize their website, go on a massive recruiting drive and develop a collective voice with the focus of getting the governement's attention so that maybe they can secure funding and make themselves known as a group that can contribute positively to the cultural and finacial welfare of BC. Maybe the BC craft brewers believe it is not necessary to organize and market together as their growth rates are decent and their support from consumers and groups like CAMRA and the Vancouver Craft Beer Week is strong and spreading the word for them. I know that some who have been supplying this support are getting fed up with the lack of action by the BCCBG to help promote the craft beer scene in BC. CAMRA YVR President, Martin Williams, for one, believes it is time for the BC craft brewers to get busy and help themselves. "BC's brewers need to work together better than they have," says Williams. "There is a vibrant brewing industry in BC. It is small and its growth is well hampered. I doubt the government in Victoria recognizes brewing as a growing industry. This recognition will only come when the BC Craft Brewing Association develops its own personality, its own voice and markets itself as a real and viable industry in BC with an important role to play." The BCCBG may point to the substantial OCB funding from the Ontario Provincial Government but I do think there is a direct link to the OCB's commitment to contributing to their local communities by supplying jobs, promoting-developing local small businesses, adding to the local economies and promoting Ontario tourism by highlighting the province as a destination to find great beer. I don't know for sure, but I suspect the OCB lobbied the Ontario government hard to get the support they now enjoy. If their website and the image the OCB is projecting is accurate, the OCB sees the craft beer industry as more than sales for its individual members and sees themselves as playing an important part in their local communities. Yes, it is about selling beers and individual businesses being successful, but there is a bigger picture beyond producing the best IPA and the OCB seems to get that. I would love to see the BCCBG here commit to cooperating with each other and take steps towards getting to where the OCB are. I would definitely love to see them band together to try to combat inducements and illegal trade practices, although that may be a mute point if the government in this province deregulates and allows inducements to exist in the light of day. Think of the positive economic spin-offs of promoting and increasing beer tourism here in BC. Think of the possibilities, as a consumer, of the breweries and brewpubs banding together to help new breweries start up in this province. The more widespread, organized and vibrant the craft beer industry is, the better it is for all involved. At least this is how I see it. I would also like to walk down to my local liquor store and buy a mixed pack of BC craft beer...imagine a box containing limited releases from Central City, Driftwood, Phillips, R&B or any of your other favourite local craft breweries. Now that is something I don't mind promoting. CAMRA held their second Advocacy and Policy Meeting, Tuesday, April 5, at the Railway Club and although the turnout was substantially less than that of the first meeting a month ago, the desire to become an active and effective consumer advocacy group was still evident. Unfortunately some of the people who were tasked to do research on the issues and subjects CAMRA YVR and their membership had identified as priorities at the first meeting could not/did not show up so there was some disruption to the forward movement. In my opinion that may not be such a bad thing as my fear is that CAMRA and their membership, due to their enthusiasm and desire to become more active, may try to take on too much, too soon, spreading themselves too thin thereby rendering themselves ineffective. It seemed, after some discussion at the end of the meeting, CAMRA YVR may in fact concentrate their efforts in certain areas and move forward with a more deliberate focus, zeroing in on one or two issues, hoping to gain some notoriety and validity as a consumer advocacy group and some allies in the political realm. The subjects of distribution and access to craft beer, taxation, tied houses/trade practices, inter-provincial trade and neighbourhood pubs were touched upon. More homework and research will be done in these areas and preliminary steps are being taken to formulate plans as to how best to attack these issues and who to target. It was widely agreed upon at the meeting that it is of the utmost importance to identify and try to gain access those who have the power to actually make changes to the rules, regulations and laws, be them under municipal, provincial or federal jurisdiction. There seemed to be a greater focus on what to do, due in large part to what has happened south of the 49th parallel recently, in regards to homebrewers and their struggles to be recognized as the artisans and have their brews legitimized. The strong presence of members from the Vancouver Homebrewers Association at the CAMRA meetings, and their willingness to be vocal and active, volunteering to do the research and dirty work required to move their cause forward, has really helped keep these issues and concerns up-front and centre. There is a tangible desire by those heavily involved in the local homebrewing scene to bring their craft out of the dark basements and sheds of the city into the light of day so they can offer their creations at festivals, competitions and eventually as retail products without fear of legal repercussions. Many of us who aren't homebrewers seem to forget that homebrewing, when traditional methods are followed and traditional, fresh/natural ingredients used, is a craft and the brews produced are craft beers and real beers. The majority, if not all, of our craft brewers started out as homebrewers before moving on to the Central Cities of the world. I recently embarked on a bus trip where some beers were shared around and some of the homebrews I tasted were outstanding. Wouldn't it be great to able to enjoy a cask beer, supplied by the Vancouver Homebrewers Association, at the next CAMRA festival? Wouldn't it be a treat to be able to rock up to your local homebrewer's shop/house/store front and legitimately buy a bottle/case/keg of their delicious craft homebrew? In addition to the homebrewers' commitment to begin wading through the bureaucracy that is responsible for keeping their beers from their adoring fans, it seems that CAMRA YVR is about to unveil their first actual campaign, aside from increasing membership, under the new executive! Recently, the federal government granted the beer industry an exemption from listing the ingredients on the labels of their products. Although most of the craft brewers I have spoken to are in favour of letting the general public know what is in their beer, they were quietly happy to see that the beer industry did receive this exemption due to the cost associated with changing labels on their packaging. From the discussions held at Tuesday's meeting, it appears CAMRA YVR is going to soon launch the "What's in Your Beer" campaign (at least that is the working title) that will have CAMRA YVR approaching local craft brewers and asking them to volunteer to list the ingredients for their beers on their websites. By listing the ingredients on their websites, there would be minimal costs attached to letting the public know what they are consuming and allow those curious to see what exactly is in their beer. 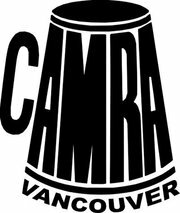 My suggestion to CAMRA YVR, via President Martin Williams, was to have the participating breweries submit their ingredient lists to CAMRA YVR (or CAMRA BC if they want to get in on this campaign) so that CAMRA can put the info in one central place on their website. By doing this, CAMRA would provide a one-stop data base for consumers while encouraging brewers to participate in the program by taking the onus of responsibility away from the breweries for changing their websites. It may also expose CAMRA to a wider cross-section of the beer-drinking public who are curious about what is in their beers and who will come to the website to access the information. Let's face it, not everyone who drinks craft beer is a CAMRA member. Not even close. Those who belong to CAMRA are the minority in comparison to the numbers of people out there who enjoy craft beer and who are not members. The final details of the "What's in Your Beer" campaign are still being discussed by the CAMRA YVR exec, but look for it to become live sooner than later. Although the numbers were down from the first meeting, the enthusiasm and desire to become a more member-driven group, who are trying to effect some change by making their voices heard, was still palpable at the meeting. A few new members showed up to join CAMRA and participate in the meeting and nearly everyone at the meeting became involved. My concern again is that the membership at large are not going to engage and that numbers at the meeting will dwindle. I certainly hope that the membership has heard President Martin Williams and his message of, what can the membership do for your CAMRA, not what can CAMRA do for the membership. The positive vibe seems to be growing, as is the membership, according to the CAMRA YVR exec, but there is still a very long way to go from being a small bunch, on the lunatic fringe, to a powerful, well-organized advocacy group. So, you think you know your beers, do you? If so, you have a chance to prove it this week and if do in fact have sufficient beer knowledge and discerning taste buds you could walk away with some dosh to help stock up that beer cellar! Wednesday, April 13/11, Legacy Liquor Store is hosting The Knock Down Drag Em Out Beer Quiz, between 7-9 PM. Legacy Beer Guru and former Storm Brewing Jack-of-all-Trades Chris Bonaille is hosting the event which will test contestants beer knowledge with 20 brain-teasing trivia & two skill-based questions followed by blind tasting of eight beers where contestants will be asked to identify the style of beer, country of origin and brand! Entry into the contest is $25 and the top beer geek will walk away with a $100 gift certificate for Legacy Liquor Store, located at 1633 Manitoba St, in the Olympic Village. If you haven't been to Legacy, it has an awesome collection of craft beers, wines & scotches. They also have many free tasting events, many involving craft beer. A few weeks back I threw down a challenge to all Vancouver beer bloggers to join me and put their money where their mouths are. Thought it might be a laugh to get a few of us together to see what we actually do know but so far only one blogger has responded with a maybe, that being Leo, writer of the Vancouver Beer Blog. Blogger. Why not, come on down for a few hours of fun...we can always find a place to debrief after over a few pints of craft beer. Tickets are available on the Legacy website...hope to see you there. Cask Beer "Are We Getting the 'Real Beer' Deal"
When I sat down and tapped out my thoughts about the local cask beer scene the other night I never really thought it would generate so much discussion and feedback. I seem to unwittingly hit a nerve in regards to the cask beer events here in Vancouver and it seems I am not the only one who has been thinking and talking about this subject. I have had much feedback via Facebook, Twitter, email and text messages and I wanted to share cross-section of these comments as I think some are very informative and bring up some very valid points about cask-conditioned beer. I am neither shy about offering my opinion nor am I hesitant about sharing criticism or feedback about what I write. I don't profess to be an expert on any of the subjects I write about but I do offer my opinions and observations in hopes of opening up dialogue and discussion and am just happy to finally have done that, even if only on a small scale. For those messages sent to me privately, via email and text, I have asked permission to repost what I received and for those sent via social media, I have just reposted as they were sent on a public forum to begin with. Warning...the email portion of the feedback is long, but may be interesting to those who are interested in this subject. 1. Flat beer in cask 2. Add yeast sugar 3. Dry hop spices 4. 2nd ferment and vent 5. Cool 24hr sediment drops serve. One comment I would like to make is that part of the process of cask-conditioning beer is the job of the barman or the cellarman. The cask must be primed just after racking from the primary fermentor and then after arrival at the pub must be left to settle for 24 hours. Then it can be vented with a spire and tapped at which point it must settle for another 24 hours. It is then ready to be tested by the cellarman to judge, based on his knowledge and experience, as to whether its ready to be served. This all relies on the pub having a person in this position. No pub I know (in Canada) has one. The one part of the article I did want to discuss a bit more (and twitter an impossible forum for doing so) is your analogy that some of the current 'casks' are not cask conditioned or Real ale in the same way that your home brew is not real ale. I am pretty certain that your home brew is bona fide real ale and bottle conditioned. As for the casks, I'm not 100% sure how the suspect casks are being produced but IMO there is one key aspect which determines real ale vs. non real ale. On the home brew side, (and also commercial beers that are bottle conditioned e.g. Sierra Nevada Pale Ale) your process results in legitimate real ale for the following reasons. The distinction between primary fermentation / secondary fermentation and what might be called tertiary fermentation is not significant with respect to real ale. Indeed, there are no real hard distinctions between them, just labels associated with conventional brewing process. Its all just fermentation. "Primary" fermentation results in a lot of sludge that drops out of suspension that can have some impact on beer flavour so conventionally we rack to carboy for 'secondary' fermentation. There is less active yeast at this point but it is still alive and working. When we bottle home brews, we fill the bottles with living beer, usually adding a small dose of fermentable sugar and seal the bottle. Fermentation does continue at this point. Unless your brewing method for bottled homebrew is unique - you are producing real ale which is truly bottle conditioned. There is yeast active alive and working in the bottle. Otherwise you get no CO2. I am sure that if you bottled then immediately pasteurized the bottles you would have flat beer. Any Co2 produced in primary and secondary fermentation has sublimated out since neither is a pressurized vessel. Crucial fermentation occurs in the bottle to carbonate the beer. This is the absolute key aspect of real ale / bottle conditioning / cask conditioning. The Co2 in the beer is a result of natural fermentation in a sealed vessel. The prohibition against pasteurizing is also important as you will have active/live yeast in the beer unless you kill it via pasteurization. Very old real ale might actually have ceased all fermentation and the yeast might actually be totally dormant or dead but I think it still qualifies as real ale. The prohibition on filtering is probably for the same reason but it also has a practical aspect in that filtering a carbonated beverage (eg after the bottle fermentation) would be tricky and you would lose some or all of the carbonation. Filtering before the bottle conditioning would, like pasteurizing result in flat beer as you would be removing the yeast and so no fermentation in bottle. CAMRA UK's dictum that the same vessel that the carbonation occurs in be the serving vessel is also probably a matter of practicality as you would lose carbonation if you rack after the natural carbonation occurs. Still IMO I completely consider that to still be real ale (natural carbonation has occurred, no pasteurization or filtering). At most you are racking off the sludge for better clarity. [Caveat that no artificial re-carbonation occurs after this point]. In truth, the amount of sludge in real ale is not that much. Most of my real ale bottles have just a small amount of sediment and are fully carbonated. I believe that a brewery who rack (but not filter) into casks after secondary fermentation, add sugar and seal the cask are creating 100% real ale / cask conditioned ale. CAMRA UK would agree. The carbonation is occurring naturally in the cask. If the filling of the cask is done properly there will be minimal sludge at the bottom as there is not much yeast still in suspension and not much remaining fermentation needed to provide carbonation. A competent brewmaster should be able to produce casks that are clear almost to the end if the cask is handled properly. If on the other hand a brewery force carbonates their beer after secondary fermentation and then fills the cask with already carbonated beer (irrespective of filtering or pasteurizing) whether one month or one minute before delivering the cask - then 100% it is NOT REAL ALE, and NOT A CASK. Plain and simple its a keg of beer. Dry hopping does not change this. Adding flavourings does not change this. Lack of pasteurizing or filtration do not on their own make a real ale. If this is indeed the process that some brewers are following with the suspect 'clear casks' then they are misrepresenting and I want to ensure this does not happen. For example today. If it was a keg of Driftwood ESB we were drinking (e.g. carbonation occurred artificially), that's fine, its a good beer and I'd still come out to try the KEG - but its false advertising to call that a cask. I agree the tilting of the cask like we saw today does make me wonder if its truly a cask conditioned ale, but the key question is that of whether the carbonation comes from natural fermentation in a closed vessel or force carbonation. My opinion, and I think its pretty close to the CAMRA view is that if its a natural fermentation from start to finish and no external CO2 its real ale irrespective of how clear or cloudy or how highly carbonated. In that case its real ale, cask conditioned. Otherwise, its just a keg dressed up as a cask. I would like to chat a bit more about what you have learned about the process taken for some of the suspect 'clear' casks as from the article I cannot completely tell whether I consider them to be real ale or not. Sorry if this all sounds like a lecture and I realize I'm probably covering mostly what you already know - just wanted to be specific about my understanding of real ale. Thanks again for the article - its great to have dialogue about cask beers and the state of the local craft beer scene. Cask-Conditioned Beer: Are We Getting the "Real Beer" Deal & Are Cask Events Here to Stay? If you are even remotely connected to the Vancouver craft beer community, unless you have been living incommunicado in a cave, you will have noticed the explosion, sometimes quite literally, of cask beer events hosted around the Lower Mainland. There seems to be a cask beer event almost every day, the latest CAMRA Vancouver Newsletter has ten listed over the next week, with some of weekly scheduled events having developed an almost cult-like following. Take Central City's monthly cask event, which takes place 4 PM, the last Saturday of the month, where unless you are there when the cask is tapped, you are not likely to get a chance to sample what is on offer and even if you are there on time, the chances of getting more than a pint are slim due to the event's popularity. The Whip's "Real Ale Sunday's" draws a regular crowd of Vancouver beer scene's insiders and often sells out in 90 minutes or less. St Augustine's "Manichean Monday's" draws people from all over the city who come to have a sleeve or two to help them ease into the work week while the London Pub's "Tap that Cask" event, held Friday's at 5 PM, has become the official kick-off to the weekend for many craft beer enthusiasts. The current situation brings to mind the song "Old MacDonald" with a cask, cask here and a cask, cask there, here a cask, there a cask, everywhere a cask, cask. And if that weren't enough to motivate and excite real beer enthusiasts, the Alibi Room has three casks on offer at all times, with the beers available dependent on what gem Nigel Springthorpe has managed to get his hands on. Cask beers have been around the city for a few years but only recently have they become so popular and their availability so widespread. The genesis of Vancouver's cask beer events can be traced directly back to the long-gone-but-sorely-missed Dix BBQ and Brew Pub (may you RIP) which can take credit for being ground zero for the current cask beer explosion in this city. According to the CAMRA BC website, Vancouver's first regular cask night kicked off at Dix in July, 2002, with their first monthly "Cask Saturday". Vancouver's first "Caskival", a festival dedicated to cask-conditioned beer, where local brewers vied for the coveted Golden Bung Award, was held at Dix in July 2003. A month later Dix again produced another first when their monthly cask night went weekly in August of 2003 and was held every Thursday until Dix closed in May, 2010. From those humble beginnings, the current cask scene has developed and grown to the point where new cask events seem to be spreading across the Lower Mainland like airborne yeast in a windstorm. Due to the shear volume of cask events in the city at the moment, it is virtually impossible to attend them all. Some of the more adventurous and I suspect single, cask beer fans have made a kind of sport out of braving as many cask events in a row as they can with the record sitting at nine, I believe. Things have never been better for the real beer enthusiast here in Vancouver and there are no signs that this current trend is going to change. But is this cask-event frenzy a craze here today, all the rage, only to be gone the way of the Pet Rock tomorrow, or is it here to stay? I thought I'd take a closer look at the whole cask-conditioned beer scene and offer up opinions on the subject from the World According to the VanEast Beer Blog. What Exactly is a Cask-Conditioned Beer? I have been asked the question, "what differentiates a cask-conditioned beer from 'regular' kegged beer? ", by many of my friend's and acquaintances and, to tell you the truth, I was not too sure of the exact details. As usual, I did not let that slow me down in giving them an answer, but I had never really put much more thought into the subject of cask-conditioned beer other than to consider whether I wanted to order one, or not, if they were on offer. As I understood it, cask-conditioned beer was fermented, at least in part, in a cask, was not artificially carbonated and was extracted from the cask by a hand-pump/beer engine style tap or gravity-fed and poured from the cask. In the interest of understanding fully what exactly qualifies a beer as a cask- conditioned beer, or real beer, I have done a little research so I can be better informed about what I am drinking and be able to properly give my friends and acquaintances an knowledgeable answer other than just flying by the seat of my pants. "Real ale is a beer brewed from traditional ingredients (malted barley, hops water and yeast), matured by secondary fermentation, in the container from which it is dispensed, and served without the use of extraneous carbon dioxide. Brewers use ingredients which are fresh and natural, resulting in a drink which tastes natural and full of flavour. It is literally living as it continues to ferment in the cask in your local pub, developing its flavour as it matures, ready to be poured into your glass. Real ale is also known as ‘cask-conditioned beer’, ‘real cask ale’, 'real beer’ and ‘naturally conditioned beer'." CAMRA UK, who state on their website that they developed the above written definition in 1970, goes on to explain that both cask-conditioned beers and kegged beers go through the identical primary fermentation process but then part ways when cask-conditioned beer is placed in the cask where it undergoes the "slow secondary fermentation in the vessel (i.e. cask) from which it is served". Cask beers are then served straight from that cask, bypassing the pasteurization and filtration step, which filters out and kills the yeast, that most kegged beers undergo after primary filtration, preventing further fermentation. It is important to note that I stated "most" kegged beers and the reason why will become apparent a little later in this post. Now I am going to leave the safe confines of the CAMRA UK website and venture out into the wild blue yonder, flying, once again, by the seat of my pants while pontificating about the current cask beer scene here in Vancouver. But if you chose to follow me on my adventure, please remember, these are my personal observations, thoughts and ideas and in no way reflect those opinions held by the owners/operators and employees of the VanEast Beer Blog. Are We Getting the "Real Beer" Deal at Cask Events Here in Vancouver? This is a more complicated question than it first appears. While there are some brewers who are actually transferring their beers into the casks, unfiltered, suspended yeasts and all, immediately after primary fermentation, where they are introducing whatever ingredients they chose to to create their unique brews before sealing the casks up to allow secondary fermentation, I suspect that not all the beers served at our cask beer nights fit CAMRA UK's definition of cask-conditioned beer. Actually, this is more than a suspicion, it is something I know to be true. What is true is that all the beers served at the cask events are coming from casks with seemingly no "extraneous" CO2, or any other gas, being used to aid in transferring beer from cask to glass. But some of the beers are not being "conditioned" in the "vessel" that they are being served from, which seems to be a key part of the CAMRA UK definition and description of cask-conditioned beers. This is not to say that those who don't follow this method are cheating us and serving substandard beers. I am simply saying that some purists would not consider many of the casks we are served at these cask events to be cask-conditioned. Have you ever watched the casks be hauled up onto the bar just before they are tapped, or watched the person behind the bar tip up the cask to drain the last drops into your glass as you thirstily awaited and noticed that there is no sediment or cloudiness visible in your perfect pint? Maybe I am a little simple, but this puzzled me at first. If a beer is transferred, unfiltered, into the cask and allowed a secondary fermentation there, should there not be yeast sediment settled on the the bottom of the cask that would be stirred up when the cask is moved which would result in cloudy beer with coodies and ya-ya bits floating about when the cask is jostled about? I know I am not the only one who has thought this because I have had comments directed my way and watched others wince when they saw the casks being tipped and flung about. When I started to write this post, I did some thinking about this - if you were close enough to me you could have smelled the wood burning as I worked through this problem - and suddenly I understood why some of the casks are good to the last drop. It is my belief that these "clean casks", those without sediment, do actually undergo secondary fermentation and are not filtered in any way, but they are not technically "cask-conditioned". These beers are similar to the "regular" kegged, craft beers we drink, which differs from the definition of "regular" kegged beers CAMRA UK mentioned. The craft breweries do keg their beers, and introduce extraneous CO2, but most, if not all, do not filter or pasteurize their beers after primary fermentation. They are instead transferred from the primary fermentation tank to a secondary fermentation tank, where the beers are allowed to undergo the all-important secondary fermentation.Once the secondary fermentation is complete and the yeasts and particles in the beer have settled to the bottom of the secondary tank, sometimes aided by finings dropped into the fermenter, the beer is transferred to a keg, CO2 is added and the beer is ready to be delivered to your local watering hole, or the beer is transferred to a cask, extra ingredients, if applicable, added and the cask sealed, ready to make its grand entrance at the next cask event gala. By this method, no actual fermentation is taking place in the cask we have our beer from. This may also explain why some of the cask beers we are being served are so flat, due to the lack of natural carbonation in the cask that would have been produced if the cask had been allowed to actually ferment there. It also explains why these casks do not have any sediment and why the beer remains clear to the last sleeve (or pint if you are lucky) even when tipped, flipped, shaken or turned upside down. I would say no. According to the CAMRA UK definition, no as well. Is that real, craft beer? To this question, I say yes. The craft breweries are brewing using traditional methods and ingredients, sometimes with their own personal twists, are allowing the beer a slow, secondary fermentation and are not filtering or pasteurizing their beers. It is just taking place in a larger tank, not the cask. Many of these types of casks I have tasted have been excellent and equal in taste and quality to those that have obviously fermented in the actual cask (sediment and sludge present at bottom of cask tips me off these are real cask-conditioned beers) and some of the "authentic" cask-conditioned beers I have tried have not been that good. Being a cask-conditioned beer does not automatically qualify a beer as a good beer. And, if done properly, a beer transferred into the cask from the secondary, that is allowed the proper time to acclimatize and blend with the added ingredients, i.e extra hops, fruits, coffee, chocolate, etc, can be a great drinking experience. On the cynical side, I do suspect though that some of these beers are being transferred into the casks and have the extras added just hours, sometimes minutes before being delivered to the event and this is evident in the final product, which in some cases have been quite disappointing. My experience and my suspicions tell me these cases are few and far between and I really hope that as the demand grows for casks, with the all the different cask events that are being held, that brewers are planning ahead. I do have to say that I did attend one cask event and thought the beer was very unique, tasty and well worth the trip. I later found out that this "cask-conditioned" beer was one of the last-minute specials, but I did not feel cheated due to the quality of the beer I enjoyed. What it did do was give me a great appreciation for how skilled our local brewers are to be able to pull the proverbial rabbit out of the hat at the last minute to provide a "cask" beer to an expecting audience. I am sure some of you are rolling your eyes and muttering to yourself that I am just splitting hairs, but let me put it to you this way...If, with my next batch of home brew, I allow my beer to go through first a primary fermentation, then transfer it to a secondary carboy where the secondary fermentation takes place and the yeast and sediment settles to the bottom, after which I then transfer said beer to my bottles, unfiltered and without extraneous carbonation, and cap them, should I be able to call these "bottle-conditioned" beers? I think not, as almost all, if not all, of the yeasts, which have settled to the bottom of the secondary have been left behind, therefore no further fermentation is taking place in the bottles. These bottled beers, as good,or bad, as they may be are just Paddy's home brew, not bottle-conditioned beers. I believe the same comparison can be drawn to some of the casks that are being served. It is not a reflection on the quality of the product, it is a reflection about how the beer should be categorized. In a perfect world, all the casks would be truly cask-conditioned for that authentic touch...it is called the Campaign for Real Ale, is it not? Having said that, if the beer is good, I will drink it, cask-conditioned, tank-conditioned or filtered through a dirty sock. I am not a purist when it comes to the beers I drink. If I like them, I drink them and if I don't, no matter what brewery they come from and how highly rated they are, I don't. Like I said before, not all things cask-conditioned are good. But I think if we are drinking beers that are not truly cask-conditioned, the brewers should let us know. I know when I see the words "cask beer", I expect a cask-conditioned brew and for some of the purists, this slight different in process is a very important one and is "the" step that differentiates this style of beers from others. Are Cask Events Here to Stay or Just a Splash in the Glass? As popular as it is at the current time, I am not so sure that the cask event movement can continue to grow and remain sustainable with the current number of craft beer drinkers in this city and the rapid expansion of the cask beer events. I do not profess to have attended every cask night, or even to have attended one at every venue, but at the ones I have attended, I see that the bulk of the crowd there drinking from the cask are the familiar faces of those who make up the nucleus of the Vancouver craft beer community. That is not to say that this trend cannot maintain and become a long-term thing here in Vancouver, but unless that community expands, I can't see the continued expansion of this cask beer craze continuing and I think that it will eventually shrink and return to just those establishments where craft beer drinkers traditionally hang out. Already I am seeing overlap in the events, two being held at the same time and wonder if this will thin the cask-beer crowd out. Maybe there are more and more people drinking craft beer at these events than I am aware of and there are enough cask beer lovers and curious customers who will try the cask beer, to sustain all of these events. If not, restaurants and bars will begin to see that numbers are dropping because the cask-beer crowd is being spread too thin and those establishments that are not traditional craft beer drinker hangouts will stop their cask nights and move onto the next fad/craze. To this point, due in large part to the support from CAMRA Vancouver and the craft beer community, there have been more than enough support for the cask events to produce interest from new establishments, some not traditionally associated with craft beer, to hold their own events to draw new customers in. I have watched St Augustine's, a well-known craft beer hangout and my local watering hole, grow their cask night from a few local, craft beer lovers to a full house, but I did note that two Mondays ago, when I last attended, numbers were down, despite it being a Central City cask and I wonder if this was because the Granville Room held their first Monday cask night, overlapping St Augustine's, that same evening. I do know that many of the regular crew who show up at St Augustine's on Mondays went to the Granville Room to check it out and wonder if this will be a trend, with those living Downtown and on the Westside no longer making the trek to the Drive on Monday nights. I hope not as the St Augie's crew have worked hard to build up and establish their cask event but like I stated earlier, there are only some many craft/cask beer appreciators around at the moment and for them to support all the events, to the point of them being successful, the Campaign for Real Ale could soon turn into the Campaign for Real Alcoholics. I also fear, as the demand for craft beer grows in this city and beyond, that with the increased demand for cask beers brewers may find that creating these casks is more of a time consumer than it is worth. At the moment, cask beers seem to be the playground for brewers, giving them a chance to deviant from their normal, day-to-day recipes to be creative and explore ideas to create truly unique brews. Some brewers seem very energized and inspired by this freedom and are producing some truly interesting, strange, quality casks, pushing the boundaries in regards to types of beers. If this passion for creating unique, quality casks continues, the quality will remain high which will help draw in more and more people into the cask beer scene which will, in turn, help it maintain and grow. If the quality begins to slip and not enough attention is paid to these casks, interest will shrink and the present craze will fizzle out like a flat cask. I do hope that this cask beer craze turns into something long-term and permanent here in Vancouver and that the increased availability of cask beer will help introduce more people to craft beer. It will give beer tourists yet another reason to make Vancouver their destination of choice and give the local craft beer drinkers the unique opportunity to drink and enjoy a sleeve of real ale on a very regular basis, at more than just one establishment in the city, instead of having to wait to try samples every few months at a crowded beer festival. Even if cask-conditioned beer is not your thing, if you are a craft beer lover, the development and success of these cask events is a positive as they potentially expose more and more people in Vancouver to craft beer and point out the the bean counters of the hospitality industry that craft beers can be money makers if they are brought into an establishment and promoted. So whether they are all truly cask-conditioned beers or not, lets hope that this current craze transforms into the norm so we can continue to drink fresh, quality craft beer in our fine city.